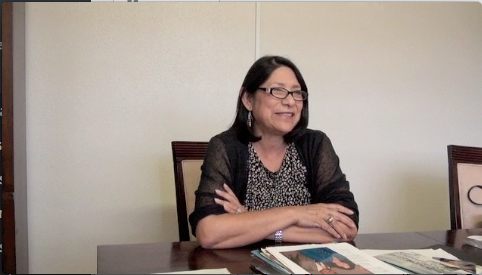 At Oak Lawn Presbyterian Church, Gracie Saenz spent her time teaching Sunday School students. Although Houston is celebrated as one of the nation’s most diverse cities, it was largely segregated with little intersection across race and ethnicity into the mid-twentieth century. African Americans primarily resided in Third, Fourth, and Fifth Ward, which also had a large Creole population. Mexicans and Mexican Americans settled initially in Second Ward, but, as their numbers grew, they moved into First, Sixth, and parts of Fifth Ward, as well as Magnolia Park. Escaping sharecropping, violence, or political unrest in the early 1900s, migrants and immigrants generally came to Houston from East Texas, Louisiana, and Mexico. Although Houston offered better employment and educational opportunities than the places they left, many of these new arrivals lived in poverty. Nevertheless, the communities and their cohesiveness played a positive role in determining their character and raising their potential for future success socially, economically, and politically. Gracie Saenz meeting with First Lady Barbara Bush in support of the Barbara Bush Literacy Program. 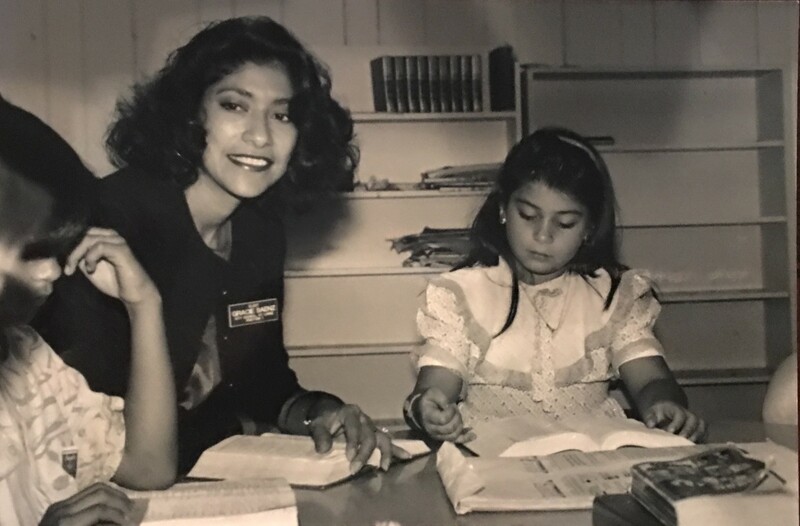 One of the success stories to come out of the city’s ethnic communities is that of Gracie Saenz, who dedicated her career to improving Houston for all its inhabitants through public service. Graciela “Gracie” Guzman Saenz was born at her parent’s home in Houston’s Fifth Ward in the 1950s. 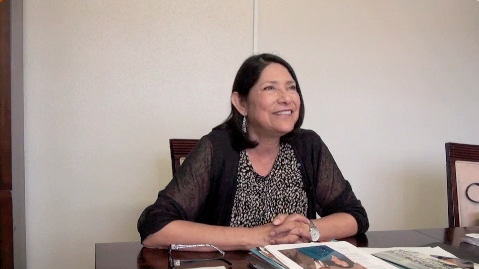 She was raised in a four-room house where she lived with her parents, a great aunt and uncle, and nine siblings in the barrio El Crisol, named for the nearby creosote plant. Like many Mexican American families at this time, the Guzmans faced their share of struggles due to their ethnicity and socioeconomic status. 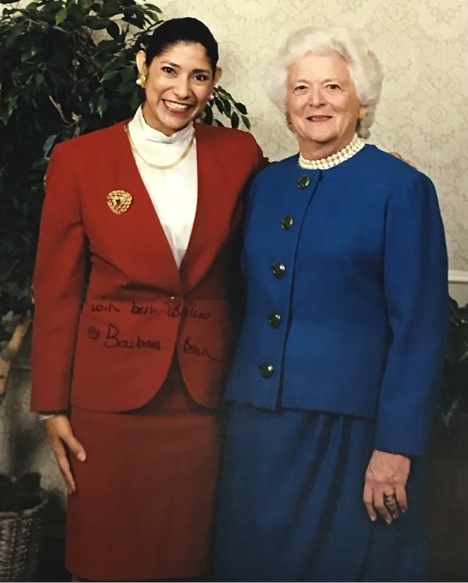 Regardless, Gracie’s upbringing, her experiences, and the support of friends and family enabled her to rise to the top as one of Houston’s most influential citizens. 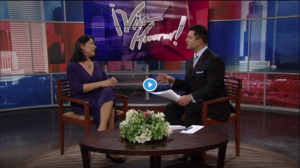 Interview on ABC13 with Gracie after the passing of former Houston mayor Bob Lanier. Gracie credits Mayor Lanier with helping her learn to navigate Houston politics. He also appointed Gracie mayor pro tem during her term as city councilwoman. 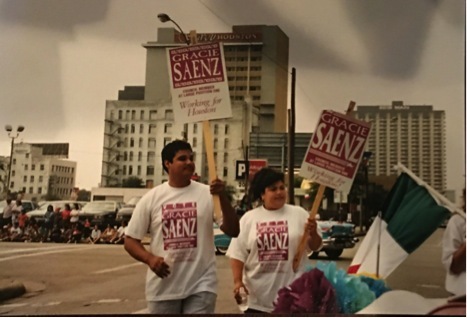 Neighborhood children mobilized in support of Gracie Saenz in her campaign to become Houston’s first at-large Latina city councilwoman. 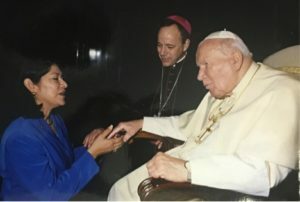 Gracie Saenz meeting Pope John Paul II at St. Peter’s Basilica in the Vatican.